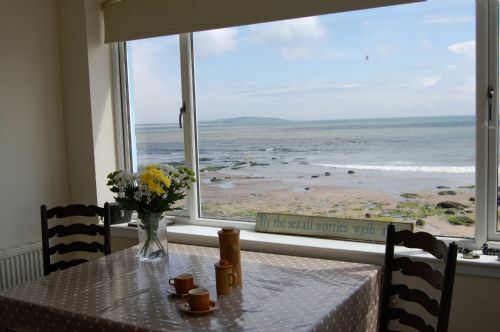 Spacious ground floor apartment in enviable seafront location paces from the beach - depending on whether the tide is in or out you will feel you are almost on board a ship - and on your doorstep Lower Largo`s long sandy beach which is a little piece of heaven!! Local pubs and shops within walking distance. Wireless Internet is provided. Central to the apartment is the large sitting room with wall to wall windows giving the best views you could wish for whatever the weather. There is a small sheltered patio area with seating for sun worshippers accessed via master bedroom or from the side of the apartment. The owner welcomes young children and can provide a travel cot and high chair on request at no extra charge. A well behaved dog is welcome. We had the most wonderful time at Fionn. We enjoyed every aspect of the house but particularly watching the beautiful sunrises and sunsets and the tide coming and going. It was just what we needed in what has been a tough beginning to the year. Thank you for a wonderful stay! Beautiful, cosy apartment and the view is simply stunning. Could have spent the entire holiday at the window watching the waves come and go. However, we managed to drag ourselves away and have fun exploring the Fife coastline and countryside - the weather was kind! Thank you for a fantastic break - can’t wait to return! ps. Jack (aged 4) enjoyed pretending the living room was his ship and we were sailing the seas - ahoy mateys!!! We are having a great time at Fionn. We have spent most of our time looking out of the window it is a lovely view. I have been watching tv it is good. We have gone to St Andrews, Elie and Leven. The beds are really comfy! !